William Chislett | The cosy world of Spanish banking was epitomised by the monthly meetings between the chairmen of the seven largest commercial banks, which were held during the Franco regime and well into the 1980s and constituted a cartel. The lion’s share of banking business in a strongly protected and highly profitable market was in the hands of the so-called Big Seven and those banks controlled by, affiliated to or associated with them. They also had major stakes in industrial companies. The average age of the chairmen was 70, long past the normal retirement age; two of them had been in their groups since before the Civil War. This situation lasted until September 1989 when Banco Santander, the sixth-largest lender, broke ranks and launched the so-called ‘deposits war’ by massively marketing high-interestbearing current accounts. This marked a sea change in the Spanish banking system. The chairman of one of the other seven banks called Santander’s new accounts ‘immoral’. Santander’s commercially aggressive chairman, the innovative Emilio Botín, had succeeded his 83-year-old father in 1987. The Big Seven have morphed over the past 30 years into the Big Two, as a result of a wave of mergers, triggered by the need after Spain joined the European Economic Community (EEC) in 1986 to be in a stronger position to defend the domestic market from the arrival of EEC banks. In 1993, Spain’s monetary authorities had to give up their power of discretion that effectively could prevent the establishment of European banks in the country. The mergers came after the 1977-85 banking crisis, one of the most severe in Europe, which affected 58 banks (more than half those existing in 1977) accounting for 27% of deposits, 28% of employees and 11% of branches. Banco de Bilbao was the first off the mark and teamed up with Banco de Vizcaya to form BBV in 1989. In 1999 the state bank Argentaria was privatised and added to create BBVA. Santander swallowed up Banco Central, Banco Hispano Americano, Banesto and most recently, in 2017, absorbed the ailing Banco Popular, which was on the verge of collapse. The seven largest banks might have been big in Spanish terms, but they were minnows on the global stage. That has changed. As well as being the euro zone’s largest bank by market capitalisation, Santander is one of the Financial Stability Board’s global systemically important banks –meaning, at least in theory, that it is too big to fail, and is subject to higher capital buffer and total loss-absorbing capacity requirements–. Santander pioneered a ‘third way’ with its expansion onto the global stage, spurning the approach of Citigroup and HSBC, which focused on serving big companies and facilitating trade, and that of JPMorgan Chase or Deutsche Bank, which created investment banking hubs in places like New York and London.12 Santander created a global retail bank (with more than 133 million clients). 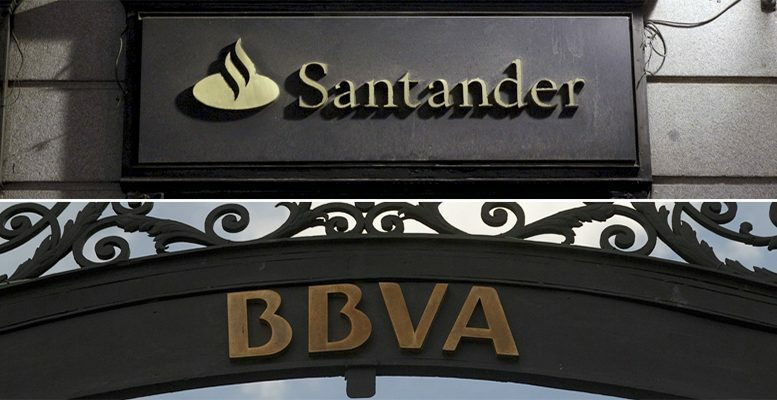 Both Santander and BBVA generate most of their profits abroad, enabling them to weather downturns in their home market. The largest slice of Santander’s profits comes from Brazil and BBVA’s from Mexico. There has also been substantial change among the close to 80 regionally-based savings banks, known as cajas, that existed in the 1980s and which accounted for more than 40% of deposits. They were allowed as of 1989 to extend beyond their traditional territory and in 1993 were free to open as many branches as they wanted around Spain, and they did so to an excessive degree. The number of savings-bank branches rose from 13,642 in 1990 to a peak of 25,001 in September 2008, while the number of branches of the more prudent commercial banks dropped over the same period from 16,917 to 15,657. Spain suffered a second and much worse banking crisis in 2009-13, following the bursting of a massive debt-fuelled property bubble which sparked a Great Recession. The total stock of loans to real-estate developers and builders ballooned to almost €500 billion (50% of Spain’s GDP). The loan defaults of property developers and construction firms as a percentage of total bank lending (known as the non-performing loan, or NPL, ratio) surged from a mere 0.6% in 2007 to more than 25% in 2012. The total NPLs of Spain’s banks peaked at 13.8% of lending to all sectors in 2013 (excluding the toxic loans placed in a specially created ‘bad bank’), up from a mere 0.7% in 2006. In five years the banking system moved from total profits of €25 billion in 2007 to losses of €74 billion in 2012. The crisis was concentrated in Bankia, the largest real-estate lender created from the merger of seven ailing cajas, which was nationalised and rescued with the help of €22.4 billion from an EU bailout that totalled €42 billion for all those banks in dire straits. Total support for the recapitalisation of banks (€62 billion) was the fourth largest in the EU after the UK (€100 billion), Germany (€64 billion) and Ireland (€63 billion). As well as Bankia’s nationalisation, the government had to intervene, force into mergers and/or nationalise eight institutions. The five largest banking groups accounted for 70% of total assets in 2017, up from 49% in 2008 (20 points higher than the EU average). The number of banks was reduced from 55 in 2008 to 14. Most of those that disappeared were cajas. A bad bank, known as Sareb, was established to absorb and re-sell soured assets in bank portfolios of €106.5 billion (€50.8 billion, after discount). Santander and BBVA did not face significant liquidity problems as they were much better managed and their international diversification gave them access to funding denied to the savings banks. The cajas were not limited companies and so did not have share capital. In the absence of shareholders, they were governed by a general assembly (representing the various stakeholders ranging from ‘insiders’ –employees and depositors– to ‘outsiders’ from local and regional governments) and a board of directors packed with political appointees sometimes with scant knowledge or experience of banking. Political control was one main reason for the cajas’ troubles. Commercial and savings banks also did not have the same regulatory frameworks. The cajas were regulated by both the national government (in charge of basic norms) and by the regional governments (in charge of the application and development of the norms). The Bank of Spain thus had limited supervisory competences over them. As well as heavy exposure to toxic assets, other factors behind the crisis were weaknesses in the regulatory framework, bad lending practices, especially in the savings banks, and the passivity of the Bank of Spain. There were serious governance problems in the cajas during the run up to the crisis, misdiagnoses by the political authorities, slowness in reacting throughout the process, vulnerabilities associated with heavy investment in the real estate sector and dependency on wholesale markets for funding. Spain exited the EU’s bailout programme in 2014. The structural reforms tied to the programme including tighter rules for coverage of NPLs and for treatment of foreclosed property and real-estate collateral, higher capital-adequacy requirements, better governance frameworks and enhanced macroprudential oversight by the Bank of Spain have strengthened the banking sector. Supervisory procedures were also improved, including extending on-site continuous monitoring to all significant banks and the introduction of forward-looking exercises in order to regularly assess the solvency position. FROB, the body responsible for restructuring the banking system, took a scalpel to savings banks: 25 cajas were integrated into seven new banks. The NPL ratio was down to around 6% in 2018 for banking business in Spain from a peak of 13.8% in 2013 and the provisioning ratio for the whole system stood at more than 40% (95% if collaterals are factored in) of total NPLs. Profitability has improved since the crisis but remained subdued, due to the low interest rate environment and the high level of NPLs in some bank. Profit before tax represented 0.71% of average total assets in 2017, down from 1.36% in 2002. Efficiency, as measured by the cost-to-income ratio, was greatly improved at above 50% compared to over 60% for Italy and the UK and over 70% for Germany. At the end of 2017, the state sold 7% of Bankia for €818.3 million, raising to €2.65 billion the amount of repaid state aid. The government has until the end of 2019 to sell off the 61% stake it still holds.